So what is an Ice Dam anyways? There is a complex interaction among the amount of heat loss from a house, snow cover, and outside temperatures that leads to ice dam formation. For ice dams to form there must be snow on the roof, and, at the same time, higher portions of the roof's outside surface must be above 32ï¿½F while lower surfaces are below 32ï¿½F. For a portion of the roof to be below 32ï¿½F, outside temperatures must also be below 32ï¿½F. When we say temperatures above or below 32ï¿½F, we are talking about average temperature over sustained periods of time. The snow on a roof surface that is above 32ï¿½F will melt. As water flows down the roof it reaches the portion of the roof that is below 32ï¿½F and freezes. Voila!—an ice dam. The dam grows as it is fed by the melting snow above it, but it will limit itself to the portions of the roof that are on the average below 32ï¿½F. So the water above backs up behind the ice dam and remains a liquid. This water finds cracks and openings in the exterior roof covering and flows into the attic space. From the attic it could flow into exterior walls or through the ceiling insulation and stain the ceiling finish. Nonuniform roof surface temperatures lead to ice dams. What causes different roof surface temperatures? Since most ice dams form at the edge of the roof, there is obviously a heat source warming the roof elsewhere. This heat is primarily coming from the house. In rare instances solar heat gain may cause these temperature differences. Heat from the house travels to the roof surface in three ways: conduction, convection, and radiation. Conduction is heat energy traveling through a solid. A good example of this is the heating of a cast iron frying pan. The heat moves from the bottom of the pan to the handle by conduction. If you put your hand above the frying pan, heat will reach it by the other two methods. The air right above the frying pan is heated and rises. The rising air carries heat/energy to your hand. This is heat transfer by convection. In addition, heat is transferred from the hot pan to your hand by electromagnetic waves and this is called radiation. Another example of radiation is to stand outside on a bright sunny day and feel the heat from the sun. This heat is transferred from the sun to you by radiation. In a house, heat moves through the ceiling and insulation by conduction through the slanted portion of the ceiling (see photo) In many homes, there is little space in regions like this for insulation, so it is important to use insulations with high R-value per inch to reduce heat loss by conduction. The top surface of the insulation is warmer than the other surroundings in the attic. Therefore, the air just above the insulation is heated and rises, carrying heat by convection to the roof. The higher temperatures in the insulation's top surface compared to the roof sheathing transfers heat outward by radiation. These two modes of heat transfer can be reduced by adding insulation. This will make the top surface temperature of the insulation closer to surrounding attic temperatures directly affecting convection and radiation from this surface. There is another type of convection that transfers heat to the attic space and warms the roof. In our photo, the winding arrow beginning inside the house and going through the penetration in the ceiling, from the light to the attic space, illustrates heat loss by air leakage. 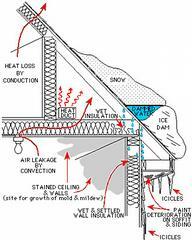 In many homes this is the major mode of heat transfer that leads to the formation of ice dams. Exhaust systems like those in the kitchen or bathroom that terminate just above the roof may also contribute to snow melting. These exhaust systems may have to be moved or extended in areas of high snow fall. Other sources of heat in the attic space include chimneys. Frequent use of wood stoves and fireplaces allow heat to be transferred from the chimney into the attic space. Inadequately insulated or leaky duct work in the attic space will also be a source of heat. The same can be said about kneewall spaces. Installing new shingles will not prevent ice dams. Prevention only occurs when the entire roofing system is addressed, including attic insulation and roof ventilation. Ideally, the temperature in the attic space should be close to the same temperature as the outside air. Attic Insulation – adding insulation to your attic will minimize the heat that escapes from the living space into the attic. Additionally, electric outlets, plumbing vents, furnace stacks, and bathroom vents can allow heat to escape into the attic. Roof Ventilation – inevitably, heat will get into your attic during winter months. Proper roof ventilation allows that heat to escape and prevents your roof deck from warming. The freeze-thaw process that results in ice damming is unlikely to occur on a roof that is properly ventilated. Underlayments, such as installation of Ice and Water barriers protect the roof deck from ice dams by creating a water-tight barrier between the shingles and the roof deck, but do not prevent ice damming from occurring.